Who will descend to the hot core so that little sunrays can come off a lady’s ears and fingers? Today is the day for some educational stuff. I think many would be curious to know how gold is found, or more technically how gold is mined and extracted from the Earth’s flesh. As everyone is aware, gold is a rare element, yet it managed to show itself everywhere except Antarctica. Precisely, adored by humanity metal can either be found on the surface or below the surface of the Earth. Originally though, all gold comes from beneath the surface – it sits snugly within rock layers that are thousands of meters deep. Sometimes, it may travel upwards, closer to the surface, on its way filling various cracks and holes within the rock. When this gold laden rock gets broken down by water, a river say, this results in surface gold. 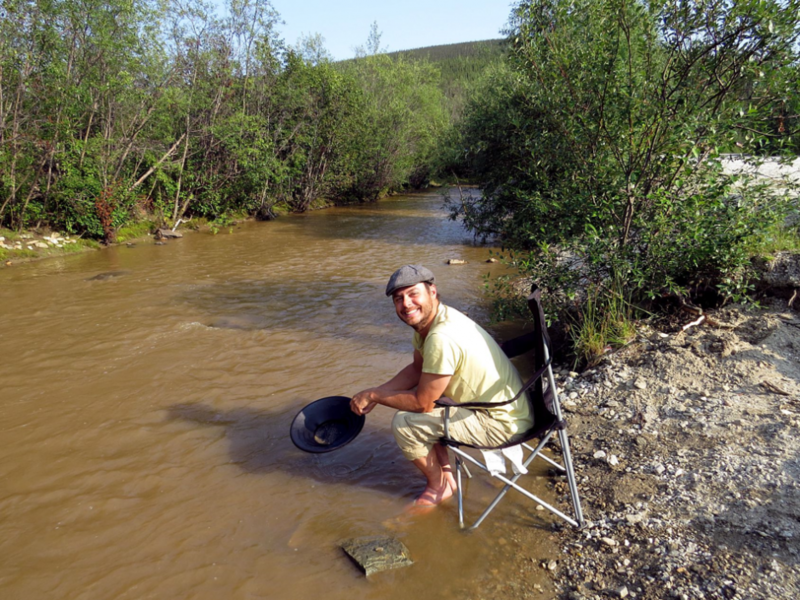 On the surface, the most common type of gold is alluvial gold. It is found in all kinds of moving water – rivers, streams, creeks. Let’s pretend a creek that you have just stumbled upon is known to have gold. If you have a container and scoop some soil from the bottom of a creek, submerge it underwater and shake it, gold grains or nuggets would sink to the bottom of a container while sand and sediments would get carried away. That happens because gold is heavier than majority of minerals and rocks found in nature. This property makes surface gold simple to separate from other useless material. A container in a shape of a pan is best suited for this purpose. Specially designed gold pans are usually circular but rectangular ones have been used as well. Two other popular ways to isolate gold from useless stuff is with a sluice box or drywasher. A sluice box acts like a small river mimicking boulders, stones and gravels which trap gold. In a drywasher, instead of water, air is what helps send gold to the bottom of an apparatus. Because a drywasher doesn’t require water, it’s good for arid areas. For instance, when looking for gold in exposed rock formations somewhere in a desert. As you can see, surface gold can be mined by anyone. And with minimal expenses. A kitchen pan will even do… no kidding. Sometimes surface gold is mined commercially, using more robust equipment of course. Although this practice is more prevalent in developing countries. Today, for commercial purposes, gold is mostly mined from underground though. Underground gold is more dispersed than surface gold. Also, it is tightly encased in a rock, called an ore. These two qualities make underground gold more difficult to isolate than surface gold and therefore completely different methods are used. However, before extracting gold from an ore, that ore must be mined from the ground and brought to the surface. To do that, ore is taken out of the ground either by open-pit mining or shaft mining, depending how deep the ore is. If gold ore is located near the surface of the earth, open-pit mining is used. Basically, a large hole is made in the ground either by digging or blasting it with explosives. About 70% of gold is mined this way. On the other hand, if gold ore is located deep below the surface it is not practical nor economical to dig a hole. Instead, to take it out, shafts and channels are used. They are vertical and horizontal tunnels that are made in the ground. One interesting aspect about deep gold mining is temperature. These underground tunnels are hot! That’s because as you get closer to the center of the Earth, the temperature rises. 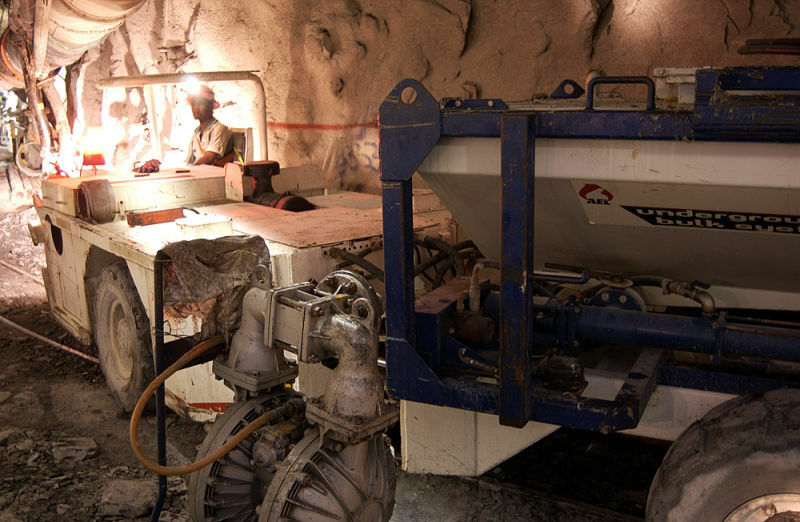 For example, today’s deepest gold mine is in South Africa, its depth is 2.5 miles (4000 km). Inside this mine, it can get as hot as 140°F (60°C). To cool it, every day tons of ice-slurry mixture is pumped down the mine. Inside the mine, large fans then blow over this ice producing refreshing cold air. However, not every corner in the mine gets cooled and workers still feel the extreme heat occasionally. One worker compared a mine to a pizza oven: “You can imagine what it’s like to crawl into a cavity there… It’s like crawling into a pizza oven.” The good side of shaft mining is that it’s less damaging to environment than open pit mining. This benefit comes with a higher price tag though. All right, whether it is an open pit mining or shaft mining, finally the work is done and a gold ore is brought to the surface. The next step is to extract gold from it. It is a difficult task (as everything in mining). Again, that’s because gold dispersed within a gigantic ore in relatively minute quantities. Obviously, people came up with techniques to do it. Two main ones are cyanide heap leaching and amalgamation, which are similar. These days, for commercial purposes cyanide heap leaching is often used. Cyanide heap leaching is done the following way. The gold ore is crushed into small pieces and gathered into piles. Then piles are sprayed with solution containing cyanide. Yeah, like a rat poison. While the solution sips through a pile to make its way to the bottom, cyanide particles found in the solution bond with gold particles. So, now solution at the bottom is essentially a gold cyanide solution. The collected liquid is then channeled into special mills where gold is separated from cyanide. Depending what method is used to isolate gold from cyanide, ultimately, a cyanide bonded to some other compound is what’s left. And any compound containing cyanide is a poison, no matter how you look at it. Amalgamation is similar, this time though the crushed ore is brought into contact with mercury. Mercury exists as liquid at room temperature so it’s ready to be mixed with pieces of gold ore right away. When gold comes in contact with mercury, two metals quickly react creating an amalgam. Amalgam is a just a mix of mercury and some other metal, in this case, gold. Then mercury is either removed by submerging amalgam in nitric or heating it. In first case, mercury nitrate is produced, in second, mercury vapour – both are nasty things to nature and wellbeing of miners. Today, this method is used by artisan miners working for themselves, both in developed and undeveloped countries. 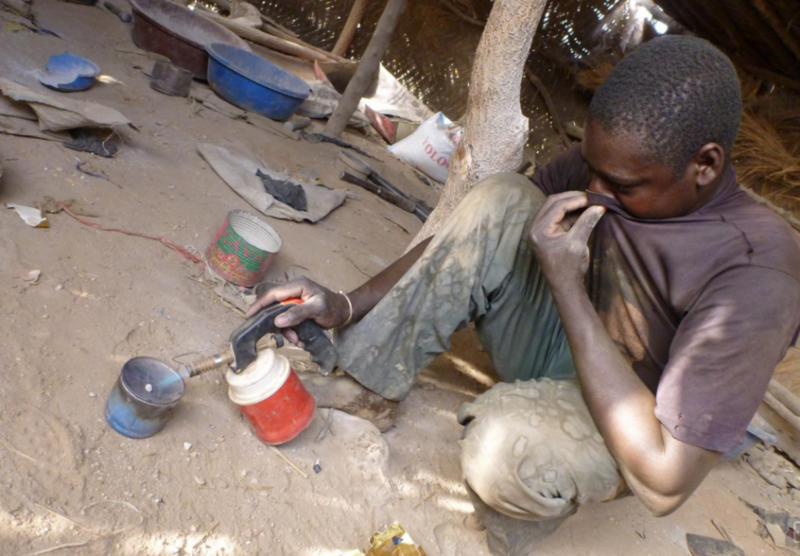 For example, pictured at the right is artisanal miner heating a piece of amalgam somewhere in Africa. His lungs get filled with deadly mercury vapour… No doubt, his shirt does nothing to protect him. Cyanide… Mercury… not pretty-sounding words. Just two of them is enough to destroy lots of trees, bunnies and humans. In fact, that’s what they have been doing. Especially mercury, as it is used to isolate gold for millennia. Sad. But there is hope. While most gold is mined and extracted using the above ways, in the recent years efforts were made to change that. Now some gold is taken out of the ground in a safer manner. About this I will be chatting in a future. Don’t forget, when you go camping or hiking next time, grab a pan, and experience the real thrill every time you see something yellow on its bottom!